It feels chilly tonight and I’m tired. 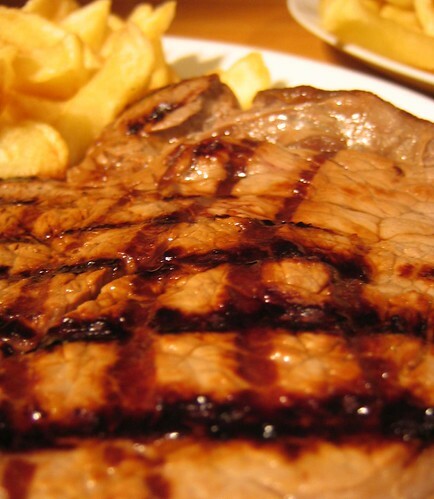 Thankfully Rob cooked – rump steak. Thick, juicy, red meat was just what I needed and I didn’t even have to cook it, so I could put my feet up with a cup of coffee and a book. Perfect. Rob cooks a damn fine steak so he’s usually the one behind the griddle pan. He’s also usually the one to buy the steak from the butchers. I think he likes being in charge of the steak buying and cooking, I guess the hunter-gatherer instincts kick in. He proudly comes home with a huge slab of meat saying ‘look at the size of that’. It must be a man thing. Leave it to rest before serving.